The BONDOLINO® is an ergonomic carrying aid right from the beginning up to a weight of max. 20 kg. You can use the BONDOLINO® for front and rucksack carrying. • The BONDOLINO® “Slim fit” is made of wonderful poplin fabric consisting of pure cotton. The "black-sand" and "sand-cream" designs are made of the elastic-woven fabric of our lightweight baby slings. The ergonomically shaped carrying pouch adapts to fit both the baby’s and the carrier’s body. 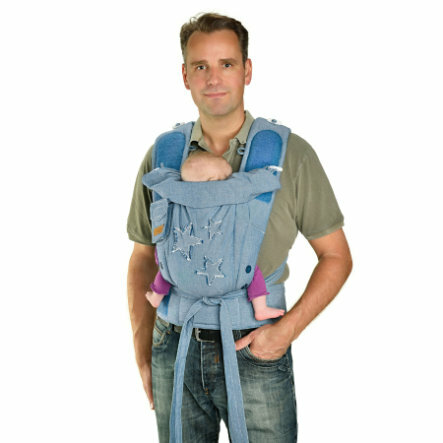 With a BONDOLINO®, you carry your baby very close to your body. • The "Slim-fit" model has a shorter waist belt and smaller shoulder straps. It is particularly suitable for petite carrying parents, and provides them with high carrying comfort. • The BONDOLINO® is extremely simple to use in many different everyday and life situations, which makes it popular with fathers! Please always pay attention to that the Velcro fasteners of the waist belt and the hood are placed exactly one upon the other before washing. Do not use a fabric softener. In no case should the BONDOLINO be spun at spin speeds of 1,000 revs or more; do not tumble dry. Tumble drying may affect the durability of the Velcro fasteners. Before you put your baby in the BONDOLINO®, always assure that both parts of the Velcro fastener are placed exactly one upon the other, firmly pressed, and remain in place when strained.